Complying with OSHA’s RCS standard can present several challenges for your company. Each type of equipment creates different levels of airborne silica particles, requiring specific dust controls for use of that equipment at the job site. OSHA provides fact sheets on their website that outline approved dust suppression methods and tips for meeting their standards. If these requirements are met, it will not be necessary to take samples of silica levels at the job site, which would need to be evaluated by a lab that meets the standard’s qualifications. Some companies may find that their current equipment is not sufficient for preventing unsafe levels of RCS exposure. They may attempt to use inefficient dust suppression methods such as using a separate water hose directed at the point of contact between the jackhammer and the material, which can have inconsistent results and require more workers to accomplish the same task. Adapting existing equipment to combine air and water lines typically requires clamps or straps that can loosen or snag, becoming potential safety hazards that must be routinely inspected and reapplied. 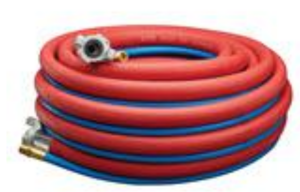 Bonded twin-line hose solutions like Parker’s Twinhammer hose help companies meet OSHA standards while creating a safer and more efficient work environment. A different Wisconsin company was cited in August 2016 for $56,950 in penalties for overexposing employees to RCS, excessive noise and carbon monoxide, and for failing to implement an appropriate training program. A $159,631 penalty was proposed in November 2016 when OSHA found workers in Ohio exposed to air contaminants including silica and other hazards. These violations were discovered before implementation of the new standard, which is stricter about dust suppression methods and allowable levels of airborne silica particles. While implementing new equipment and providing appropriate protection for workers can create some short term downtime and costs to your company, these challenges must be balanced against the long term health benefits of creating a safe work environment and the much steeper fees associated with OSHA non-compliance penalties.